Home / Parenting / Will I have to stop swimming? I’m sitting in a circle of preteen girls in my lounge. We are surrounded by an array of pads and tampons, a felt womb and glasses of red water. I’m introducing them to what happens when they start their monthly cycle, how to catch the blood, how much there will be. We have a lot of fun seeing how a pad with wings sticks to a gusset, how much water a tampon can absorb, and figuring out where that tampon will go using the felt womb. One of the girls’ first concerns is “What will I do if I start when I’m away from home?” We make action plans. Figure out who to ask for help. Have fun filling a pencil case with essential emergency supplies. “Will I have to stop swimming? or dancing? gymnastics?” they ask next, looking crestfallen. Not at all, and you have choices. Lots of sportswomen use tampons. And if you don’t fancy that you can wear leak-proof swimwear and leotards and dark breeches. Or if you’re feeling really adventurous there’s menstrual cups and sponges too. Actually, when you’re in the water, women tend to find that the blood doesn’t flow much. Have a dark towel nearby to wrap around you when you get out, just in case. Many dance schools and gymnastics clubs relax the dress code at those times of the month when girls may want to wear a pad under tracksuit bottoms or shorts. I tell the girls they’re joining a club of all the women and girls the world over who are menstruating. It’s natural to feel self-conscious at first but they’ll be surrounded by people who understand. So even if they may feel shy about asking for help, we won’t feel awkward helping them. 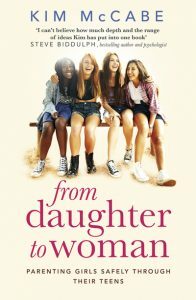 If you want guidance and help to find the words to explain puberty and periods to your daughter, read ‘From Daughter to Woman’ chapter 3 Periods — bloody nuisance or bleedin’ miracle? Let’s make this comfortable for our girls.